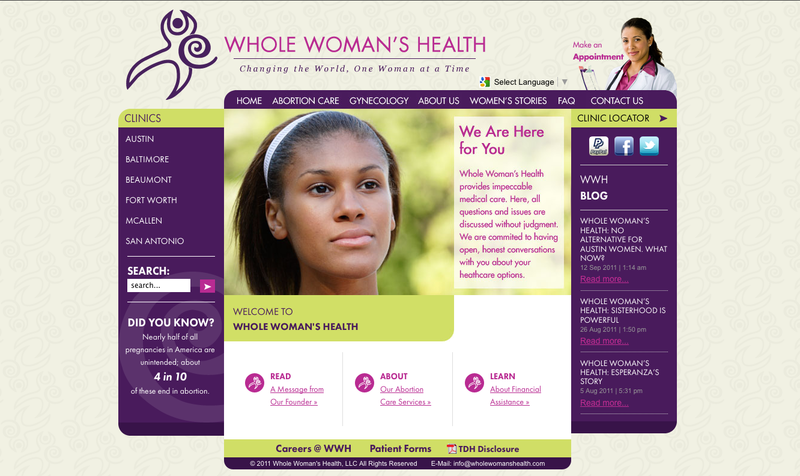 Whole Woman’s Health new website debut! This is big news for us! We’ve been designing and re-designing and re-re-designing for quite a while now. Today we finally got to premiere our new, fancy website! 1.) Patients can make an appointment from our home page! 2.) Our blog is front and center, allowing more people access to the “behind the scenes” of Whole Woman’s Health, and recent news. 5.) We have new Press, Patient Testimonial and FAQ pages! 6.) Patients can now search the entire website to find exactly what they’re looking for. Oh, and 7 – It’s just so pretty to look at, if we do say so ourselves. As happy as we are with it, it’s still a work in progress. We’ve got big plans that will allow the public to contact us, ask questions and interact with Whole Woman’s Health staff in brand new ways. This is definitely a new chapter in WWH’s online presence. We hope you’ll share your feedback with us! Whole Woman’s Health: No Alternative for Austin Women. What now?